What could be wrong about an entire mango in a bottle of juice? What if there was no added sugar but just non-GMO fruit mixed in a bottle for your healthy consumption? 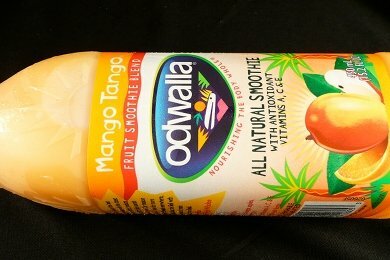 My kids go nuts for this flavor of Odwalla smoothie: Mango Tango. I bought this bottle for $3 (yikes) at my local supermarket because a reader asked me what I thought of these. Well, they taste great, they are made with fruit purees and juice (no concentrated juice) and they are chock full of vitamins. This bottle contains 100% of your daily value of vitamin E, 50% of vitamin C, and 25% of your vitamin A. So, compared to something like Soda, you are doing great! Soda has a bunch of sugar and no nutrients. Odwalla has a bunch of sugar and lots of nutrients. Odwalla is actually owned by The Coca-Cola Company. I guess the Odwalla branch "nourishes the body whole", while the Coke branch rots teeth. I wonder what their meetings are like? This Odwalla smoothie has more sugar per serving than Coke. Yes, it is the same as Minute Maid Juice or apple juice - 45 grams of sugar for a 12 ounce serving. Coke has 39 grams of sugar per 12 ounce serving. The dilemma with juice is that it's processed fruit. The sugar in a Mango is locked up with all this fiber and water. A Mango has 3 grams of fiber in one cup. How many grams of fiber in Mango Tango? The package says "Not a significant source of dietary fiber". Where did it go? The fiber got lost in the processing of the mango into juice. No fiber is a problem. Dietary fiber makes you feel full. This "smoothie" form of mango isn't going to make you feel full, and so the calories (while not empty) aren't great for us who have a problem keeping off the pounds. What to do? I say treat these as a treat! Use them to replace soda or ice cream because they are better for you than those choices. Do not treat them like water or a snack that will fill you up. At my house, that one bottle of smoothie got spread over 2 days of treats. Substitute Cucumber Orange Water for your smoothie habit or make your own for fewer calories like my Chocolate Smoothie. Do you buy packaged smoothies? What do you think of them? Great review and advice! I feel the same way about smoothies like that. Great article and a good reminder for those of us who grab these little gems on the way out the door. One thing I've learned in my forever of dieting is that I need to chew my calories. Drinking smoothies/slim-fast/meal replacements is totally lost on me because my brain still thinks I'm hungry so I just end up eating that much more! Thanks for the review - I totally agree. This is why I am a fan of smoothies over juices - there are a lot of people that juice at home, and while I figure that those juices must have lots of great nutrients, I'm a big fan of getting my fiber too! So I bet you could replace this also with a mango smoothie made at home, at a much lower price! I make my own "mango soft serve" using a frozen banana, frozen mango chunks, plain yogurt, and milk. I swear it tastes just like ice cream, mango flavored. wow - I would rather peel and eat a Mango. Another drawback to packaged juices is that they're all pasteurized. That makes them not the same as fresh raw fruit, regardless of what the juice makers' tell you. I also go with the fresh mango smoothie, made with almond milk (homemade preferably), a frozen banana, coconut oil and 2 raw organic eggs. Another great post. You do a great job on providing solid info for your audience to make healthier choices. Keep it up! I agree with you! Not worth it. And I need to chew my calories too, like another reader said. If I drink my calories I will gain. Eek! Not a huge fan of smoothies and other "health" drinks. For all the processing and sugar that goes into them, I'd frankly rather get the sickly sweetness and caffeine rush of a coke... Or stick with regular fruit juice. @annfeld (my wife) likes her fruit whole. Best for me is one of those juices that only uses other juices to sweeten. Cranberry with grapes for example. There products used to be non-pasturized until they got a much larger distribution area & had some problems w/ spoilage, etc. I am not saying that "smoothies" or bottled juices are good replacements for fruit but to compare them next to Coke doesn't really seem like a fair comparision to me. What I do for fiber with these type smoothies that have removed the fiber is use non flavored psyllium Husk. You can buy huge containers of it at walmart or wholesale stores. So any time you have these, just add some this and you can gain back the fiber contents that was lost. Hi, I'm a bit late to your post but I just wanted to point out that not all sugars are created equally. The sugar in Odwalla is different from the sugar in Coke. You have to judge sugars by the glycemic index. And whereas the sugar in Coke is refined and added, the sugar in Odwalla is from the fruit. Elsewise, I agree about the fiber, although I don't think it is completely missing. That said, we're left to wonder what quality of fruit they use. I add a tablespoon of chia seeds to my Odwalla smoothies to add protein, fiber, omega 3, lower the overall glycemic index and increase the length of feeling satisfied. = an easy, delicious breakfast smoothie, packed full of protein, micro nutrients and fiber. Where do you get the idea that Odwalla is non-GMO? Their juices aren't Organic. I have had a year of health problems, my son who lives in Brazil wants me to try these drinks to build up my energy,he swears they will help me.